If you drive a white Cadillac Escalade, I just saw you! It was totally awesome. 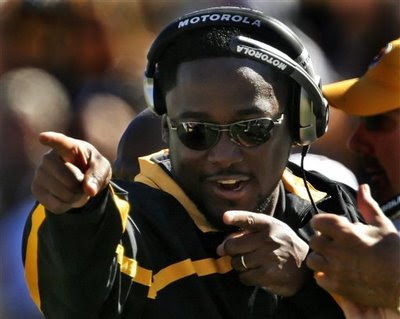 UPDATE: MIKE TOMLIN DOES INDEED DRIVE A WHITE ESCALADE. BOYFRIEND AND I SAW IT IN HIS DRIVEWAY TODAY. YES, WE ARE HIS NEIGHBORS. We totally found out where Mike Tomlin lived when he moved here, and did a drive-by of the house. Didn't see his Escalade though. Also: I LOVE HIM. And I love his hair. Have you seen his hair in HD? It is PERFECT. No Ghosts. Just Quiznos Today.